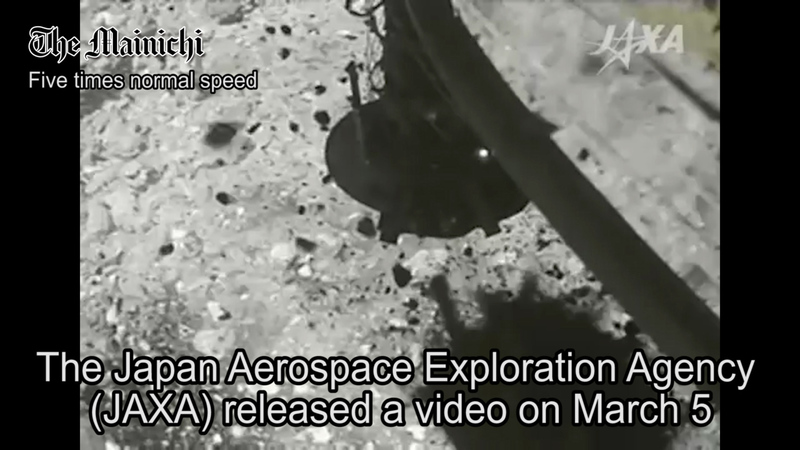 TOKYO -- The Japan Aerospace Exploration Agency (JAXA) released a video on March 5 showing its space probe Hayabusa2 touching down on the asteroid Ryugu. The images were taken by a camera on the spacecraft that was created using donations of about 12 million yen from the general public. 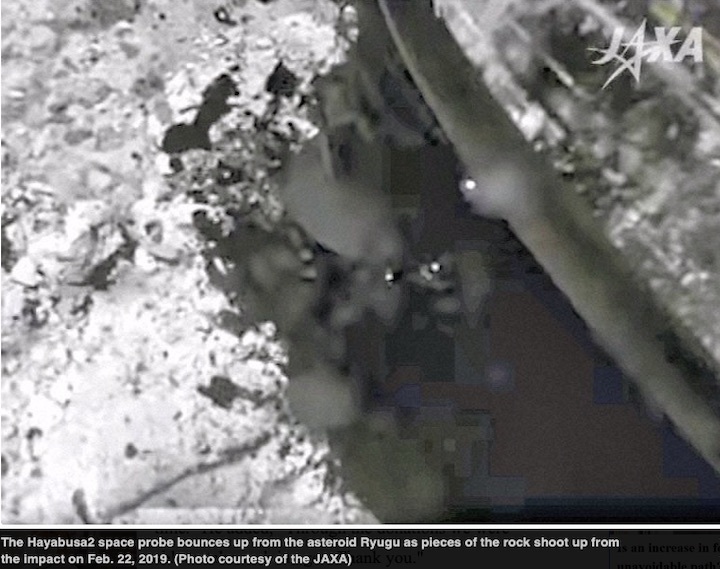 They show pieces of rocks and stones on the asteroid's surface being raised like confetti when a tubular device to collect materials touched down and bounced up. Project manager Yuichi Tsuda said at a press conference in Tokyo, "They are really fantastic images. I felt a thrill when I saw them for the first time." He added, "Through the donations we were able to take such images. Thank you." The images, released Tuesday, show sand and rocks flying up after the probe fired a bullet into the asteroid to collect samples. The probe is scheduled to make the first-ever attempt to create a crater on the surface of an asteroid in early April, then make a second landing near the crater in May or later. 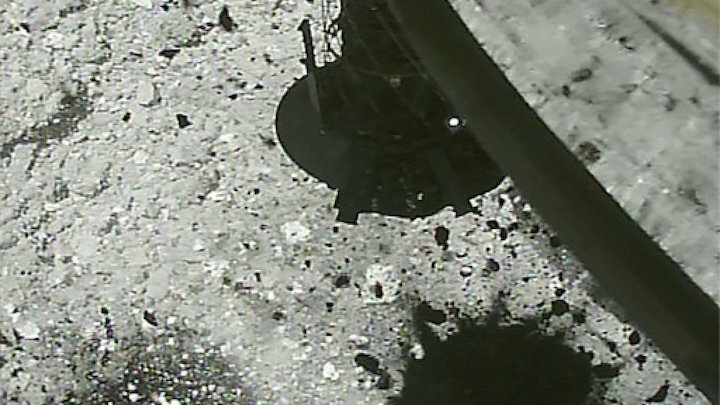 Hayabusa2 landed on the surface of Ryugu for several seconds on Feb. 22. A camera attached to the side of the probe showed a cylindrical sample-collection device making contact with the ground. Sand and rocks ranging from several millimeters to tens of centimeters in size were sent flying by the bullet’s impact and the firing of the probe’s engine. Due to the asteroid’s slight gravity, these are seen hovering in space for a long time. 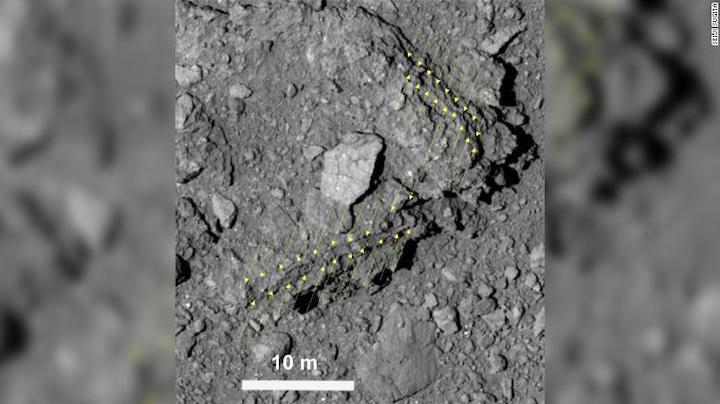 The geology of Ryugu’s surface “appears to be rough like pumice and quite fragile. Fine, confetti-like material was also kicked up, which we believe to be part of the stratiform structure,” Hayabusa2 Project Scientist and Nagoya University Prof. Seiichiro Watanabe said at a press conference. The camera was developed using about ¥12 million donated from everyday citizens. “These wonderful images were possible because of your donations. We are truly grateful,” JAXA Project Manager Yuichi Tsuda said. The landing site has been nicknamed “tamatebako,” after the mysterious box that appears in the “Urashima Taro” folktale, according to the project team. JAXA also indicated that the original plan to perform three landings would be reduced to two, mostly because the sample size obtained in the February landing was sufficient. After the crater is made and more samples are collected in the second landing, a third will probably not be necessary, the agency has determined. 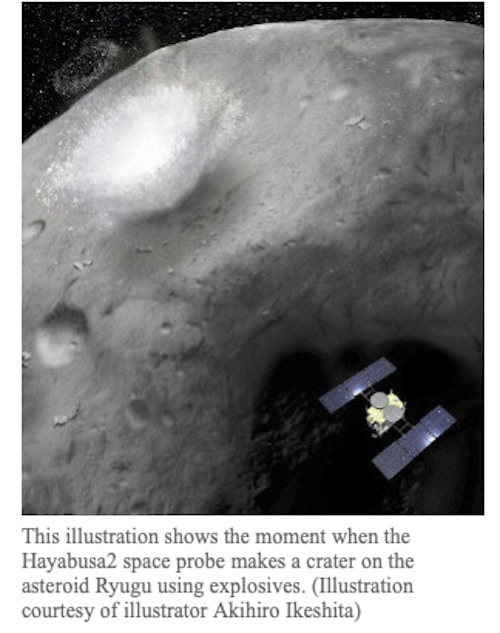 Japanese researchers publish three studies on the object of Hayabusa2’s attention. Richard A Lovett reports. A one-kilometre-wide asteroid known as 162173 Ryugu, currently being mapped by Japan’s Hayabusa2 spacecraft, looks like a giant “pile of rubble” shaped like a spinning top, planetary scientists report in a trio of papers in the journal Science. The asteroid also has extremely low density, indicating that it is riddled with porous gaps, much like a chunk of Styrofoam or Swiss cheese. To determine the asteroid’s shape, the scientists used photographs from multiple angles, and laser range-finding mapping of its topography to create a 3D model. Its porosity was calculated by watching as the spacecraft fell to within 850 metres of the surface, then rose to 5.4 kilometres. Based on this, says Sei-ichiro Watanabe, of Nagoya University, Japan, it was possible to determine the asteroid’s mass, volume, and average density. The third of these are so low that gaps of various sizes must make up half of the asteroid’s volume, he says – assuming it is made of the same type of minerals as a class of meteorites known as carbonaceous chondrites. The spinning top shape, he adds, is probably a leftover from its youth, when rapid rotation deformed it into a flattened shape with a prominent equatorial ridge that still persists, even though its rotation has now slowed to a sedate 7.6 hours. Why this ridge has not slowly flattened out, Watanabe says, is an open question, but he thinks it’s because the surface materials on Ryugu must not easily avalanche. “It seems the friction angle of materials on Ryugu is large enough, so the relaxation process would be rather slow,” he says. In another study, a team led by Seiji Sugita, of the University of Tokyo, Japan, used data from the spacecraft’s near-infrared spectrometer to find that water-containing minerals are “ubiquitous” across Ryugu’s surface. That said, these materials appear to have been “thermally metamorphosed” and partially dehydrated. Most likely, Sugita says, Ryugu stems from a parent body that was formed about 4.56 billion years ago, at the birth of the Solar System. That body experienced a high level of rock-water reactions in its interior, which formed the hydrated minerals now found on the asteroid. After that, however, it went through a partial dehydration process, possibly due to internal heating that caused some of these hydrated minerals to break down, thereby losing water to space. Then, about a billion years ago, a large collision broke up the parent body. One possible parent body would have been the predecessor to the Polana collisional family, named for the 38-kilometre asteroid known as 1112 Polona, the parent of which broke up 1.4 billion years ago. The other would have been the parent body for 495 Eulalia, a similar-sized asteroid and the product of a break-up 800 million years ago. Debris from the collision then re-accumulated into rubble piles, one of which became Ryugu, or perhaps its more immediate parent body, from which Ryugu was generated via yet another impact. That said, it’s too soon to attempt to generalise these findings to other asteroids, Watanabe says, because Hayabusu2 is not the only mission currently investigating a near-earth asteroid. NASA’s OSIRIS-REx mission is currently orbiting the slightly smaller asteroid called 101955 Bennu, and is also expected to announce its initial findings very soon. “Comparative study of Ryugu and Bennu will tell us their commonalities and differences,” Watanabe says. 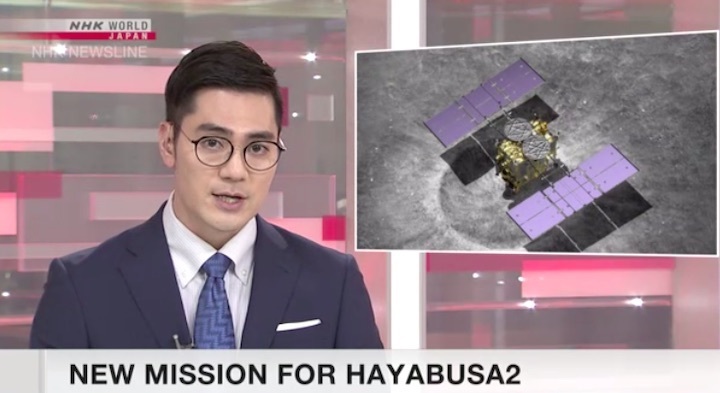 Meanwhile, he adds, Hayabusa2 is a sample-return mission, designed to collect material from the asteroid’s surface and bring it back to Earth for analysis by the end of next year. One goal of the current studies is to pick the right place from which to collect the sample – ideally one that helps us understand how the asteroid got its spinning-top shape. Another goal is to understand how asteroids such as Ryugu helped bring water to Earth, says Kohei Kitazato, from the University of Aizu, Fukushima, and lead author of the third paper published in Science. “In order to know how much asteroids like Ryugu contributed to terrestrial water, it is important to understand how much water had been preserved in their interior,” he says. “Our observations on Ryugu strongly suggest that the abundance of water bearing materials (and organics) on asteroids is controlled by dehydration due to radiogenic heat during its early history. Studying these asteroids may also be important to understanding the threats they may pose to our future, if someday we find ourselves faced with such a body on collision course with Earth. In April, Watanabe says, an experiment called the Small Carry-on Impactor Experiment will shoot a 2.5-kilogram copper bullet at the asteroid in order to find out how its surface layer is glued together. The results could be useful if, someday in the future, we find ourselves faced with the question of how to divert such a body before it hits us. Ryugu is a carbon-rich C-type asteroid about 900m wide. An unmanned Japanese spacecraft orbiting an asteroid has made surprising discoveries that scientists say will improve understanding about the origin's of the Earth's water and help search for life in other solar systems. 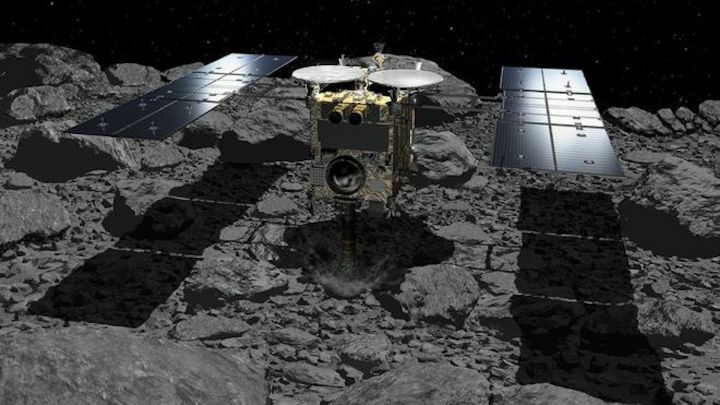 Scientists working on Japan's Hayabusa 2 space mission said that by using a wide range of cameras and instruments to collect images and data about the near-Earth asteroid Ryugu, they had made some "tantalizing discoveries." "The primary one being the amount of water, or lack of it, Ryugu seems to possess," said Seiji Sugita of the University of Tokyo's Department of Earth and Planetary Science in a press statement as the mission released its initial findings. 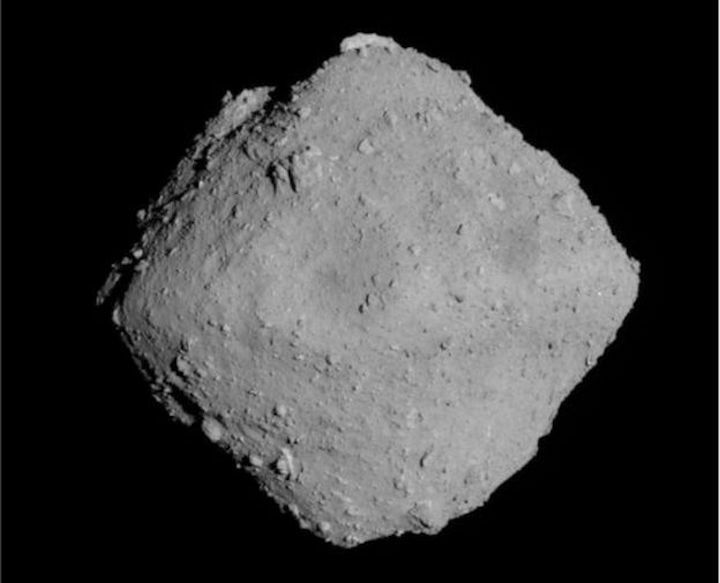 "It's far dryer than we expected, and given Ryugu is quite young (by asteroid standards) at around 100 million years old, this suggests its parent body was much largely devoid of water too," Sugita added. The finding is significant, he said, because of all of Earth's water is thought to have come came from local asteroids, distant comets and the nebula or dust cloud that became our sun. "The presence of dry asteroids in the asteroid belt would change models used to describe the chemical composition of the early solar system," he added. The discovery also has implication for finding extraterrestrial life. "There are uncountably many solar systems out there and the search for life beyond ours needs direction," Sugita said. "Our findings can refine models that could help limit which kinds of solar systems the search for life should target." The mission's three initial papers published in the journal Science on Tuesday described the mass, size, shape, density, spin and geological properties of the asteroid, a porous "pile of rubble" shaped like a spinning top. Ryugu is extremely dark and looks blacker than coal to our eyes. The Japanese space agency, JAXA, research has also benefited from cooperation with NASA, which has its own probe, OSIRIS-REx, exploring a different asteroid known as Bennu. NASA and JAXA share data from their respective missions and this cooperation has thrown up a further surprise. Both Bennu and Ryugu are extremely dark, spinning-top shaped asteroids that are covered in large boulders, but the latest findings show that Ryugu is a lot drier. Researchers had expected the two asteroids to have similar levels of water, but the discrepancy has opened up new avenues for future research. "Thanks to the parallel missions of Hayabusa2 and OSIRIS-REx, we can finally address the question of how these two asteroids came to be," Sugita said. "That Bennu and Ryugu may be siblings yet exhibit some strikingly different traits implies there must be many exciting and mysterious astronomical processes we have yet to explore." Other scientists shared Sugita's optimism. "It seems that the asteroid formed as a spinning rubble pile from a previous generation of asteroidal parent bodies, and that those parent bodies had undergone thermal or shock metamorphism," said John Bridges from the space research center at UK's University of Leicester. "This is far from the old stereotype of a potato-shaped, inert and perhaps rather dull, gray asteroid," he added. "Ryugu shows that asteroids have recorded an incredibly rich history." Some scientists echoed Sugita's initial reaction to the discovery of the asteroid's lack of water, which he surmised by saying, "what felt limiting is now enlightening." Matthew Genge, an earth and planetary scientist from Imperial College London, said Hayabusa 2 had aimed to be the first to sample a C-type asteroid rich in water and carbon-rich objects because they are thought to preserve the best record of the earliest stages of the solar system. He added that Ryugu appeared to be a type of asteroid that had had its history of the early solar system "overwritten" by a heating experience. Japan's Hayabusa2 space probe is set to start descending toward an asteroid in about two days on a new mission to create an artificial crater on its surface. Hayabusa2 has been observing the asteroid Ryugu, about 340 million kilometers from Earth. The Japan Aerospace Exploration Agency, or JAXA, says the probe will make the world's first attempt to create an artificial crater on an asteroid and study its interior. The probe is to continue to move down slowly and, at 500 meters above the surface, release a device called an impactor at around 11 a.m. Friday. The impactor is designed to explode 40 minutes later to fire a metal object into the asteroid's surface at a speed of 7,200 kilometers per hour. Mission Manager Makoto Yoshikawa told reporters that his team will take on a new challenge that would have been inconceivable with Hayabusa2's predecessor. He said team members are tense, but will be united to successfully conduct the mission they've carefully prepared for. 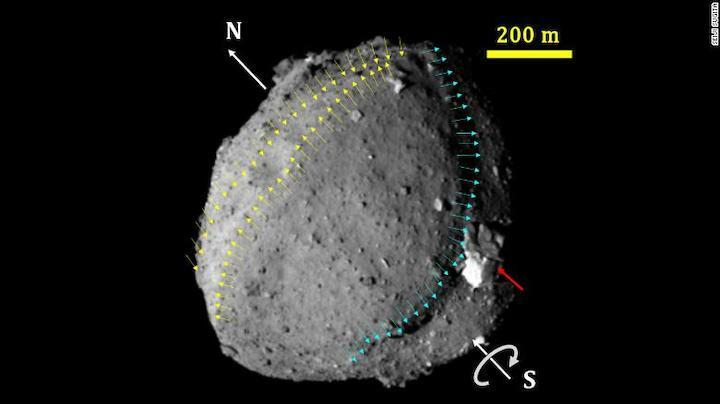 The mission follows Hayabusa2's touchdown on the asteroid in February. 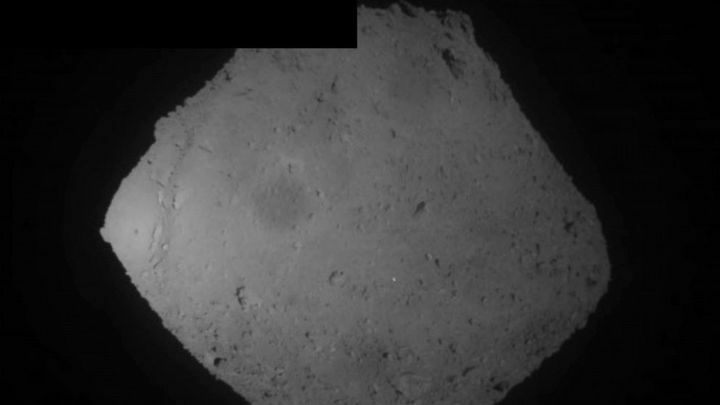 JAXA believes the probe collected rock samples as planned. Japanese space probe Hayabusa2 is making a descent toward the asteroid Ryugu in a new mission to create an artificial crater for a study of the celestial body's interior. The asteroid is located 340 million kilometers from Earth. 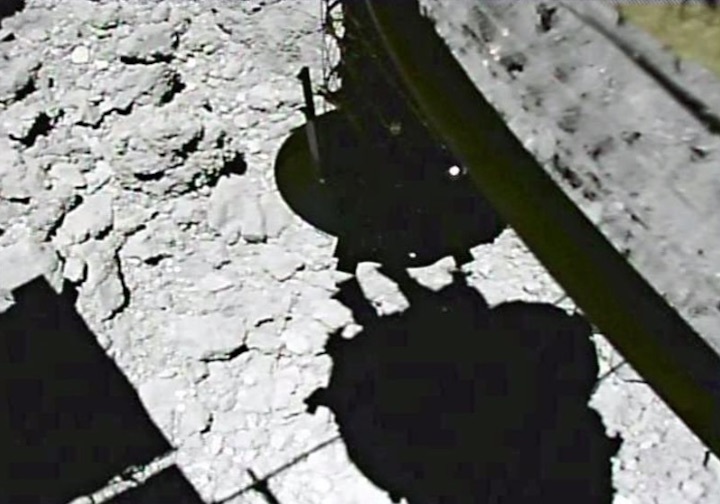 The Japan Aerospace Exploration Agency, or JAXA, says the probe began its descent toward Ryugu from an altitude of 20,000 meters at around 1:00 p.m. on Thursday, Japan time. According to the plan, Hayabusa2 will release a device called the "impactor" shortly before 11 a.m. on Friday when it is 500 meters from the asteroid. Forty minutes later, the "impactor" will explode and shoot a metal object into the asteroid's surface at 2 kilometers per second to create an artificial crater. JAXA is planning to have Hayabusa2 attempt a second landing on Ryugu at a later date to collect rock samples from the crater. The probe made its first landing on the asteroid in February. 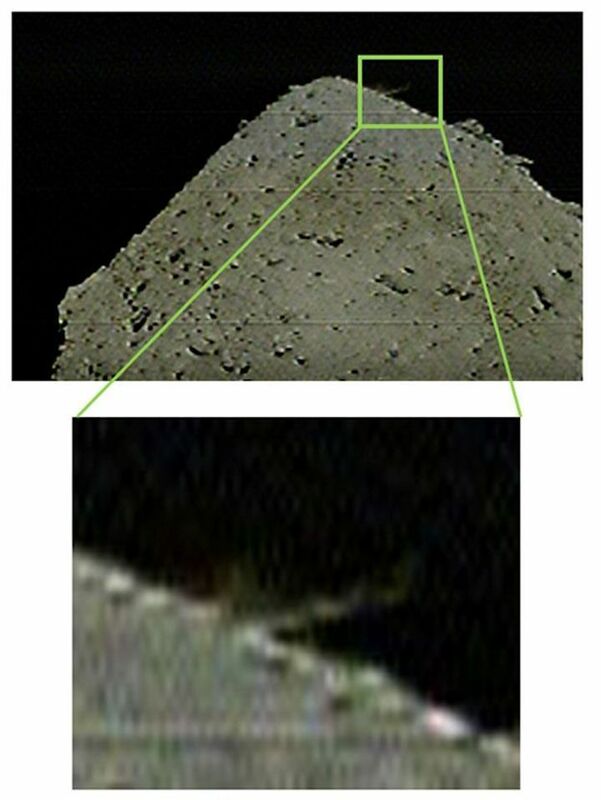 JAXA officials have said the probe is believed to have collected rock samples during that time on the asteroid.